Earlier this year, we added a feature to let you compare individual listings across Amazon, eBay and Half. The feature is great for shopping because it queries the three vendor sites directly and compiles up-to-date results in one place. You can be sure you're getting the best deal without having to visit each site separately. 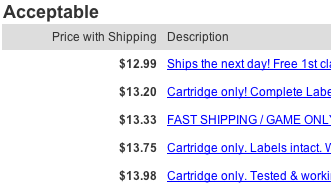 The resulting comparison price now includes the shipping cost for each item. This was the most requested enhancement to this feature. Unfortunately, Amazon doesn't provide an API for for shipping prices, so we assume $3.99 shipping for each Amazon listing. It's not ideal, but reflects typical Amazon shipping rates. eBay and Half listings reflect the actual shipping returned by their APIs. Let us know in the comments if you want any other enhancements to this feature. Happy holiday shopping! Will Super Mario All-Stars Stay Limited Edition?